Merrick Backcountry Dry Dog Food is a freeze-dried meat kibble product. 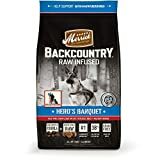 Merrick Backcountry Dry Dog Food is grain-free and combines a meat protein such as rabbit, venison or salmon with sweet potato, vitamins and minerals. Merrick Backcountry Dry Dog Food is available in a variety of flavors and formulations for different dog ages and health needs.